Our reputed entity is engaged in supplying Echo Cornet. We are engaged in offering Echo Cornet. - Material: solid brass with nickel/chrome plating. We are providing Echo Cornet to our consumers. All the tubes, sheets and rod are of superior quality with a special high grain structure for better finish and strength. Banking on our enriched industry experience, we are able to supply Echo Cornet. 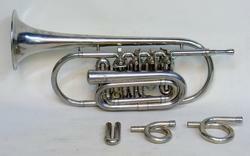 We are engaged in offering a ideal collection of brass nickel plated Cornets. These are wind instruments, which are played in many western concerts. Cornets are similar to trumpets but preferred for younger players as these are easier to hold. Our cornets have an exquisite finish and long life. We are remarkable entity in this domain, engaged in trading and supplying a wide array of Cornet Instrument to our valued clients. - Used in marriage and other occasion. 100% Genuine with no defects.Includes a carrying case and a mouthpiece.Proudly Made in India.Smooth action valves, & comfortable white faux mother of pearl inlaid buttons. Army Bag Pipe Musical Co. is offering Soprano Cornet on customer requirement. We are amongst the most reputed names in the industry, offering Echo Cornet. Being a leader in the industry, we are engaged in offering a qualitative range of Musical Cornet to our customers. 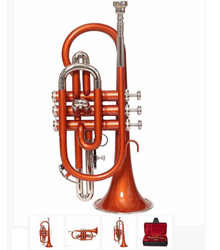 The “TRISTAR cornet offers great value for money. It has a characteristic warm, mellow tone, which can be distinguished from the more penetrating sound of the trumpet. Ideal for young beginners as it is easier to hold, with its centre of gravity much closer to the player. A hard case and mouthpiece are included. This is a beautiful cornet made of high quality brass in brass finish. A mouthpiece and beautiful sleek case is included. also included is a free mute. A mute is a great accessory when you want to practise without disturbing others around you. A fantastic $40 value included for free! it offers a great value for money.